HecAndrade On the @metrolosangeles 550 and just spotted TWO roaches. Great! DaftElf @metrolosangeles :: Can Blue Line drivers @ 7th/metro tell Red Line is unloading? Always leaving w/ empty seats & people running up stairs. PBunches No word on why the 720 bus is on detour on either @metrolosangeles or on metro.net but you should expect delays. HecAndrade Where’s the @metrolosangeles 550? Oh, nowhere to be found. Surprise. soulbarn HUZZAH! @metrolosangeles finally institutes cash-value TAP cards. Now, let’s get NY-style bulk ride discounts. thelittlefella Hallelujah! @metrolosangeles: Ticket machines that sell TAP cards and stored value coming to Metro Rail station near you. mysocalledtweet I have to find another excuse to take Metro often. I wanna tap, tap, TAP too! the_anty Finally! RT @metrolosangeles: Ticket machines that sell TAP cards/stored value coming to Metro Rail station near you. alloutattack @metrolosangeles Adding “stored value” to my TAP card was fast & strangely satisfying. However SV term is too clunky for a service roll out. Observations in transit and a few good ideas, after the jump. sallywasmyride Oh @metrolosangeles how I missed your ever changing display of the crazies! sallywasmyride Early day on @metrolosangeles. The moon is still out. First day of the rest of my life. RedEbbm I want to start a campaign to get @metrolink to use TAP now that it’s getting good use on #metrolosangeles Good idea? 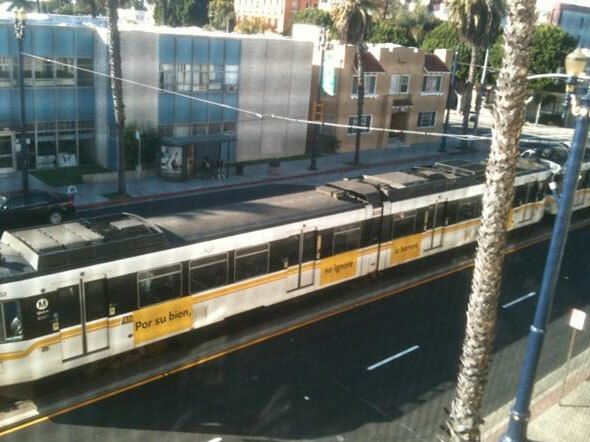 ieko1224 @metrolosangeles make use of Silver Line brand, cut 445, extend some SL trips to Pedro. Then people will know about Carson & PCH stations!